Well, I will not be at the World SF Con this year. Too tired and too busy amongst many things going on, however, here's my pre and post Worldcon "Art Sale". 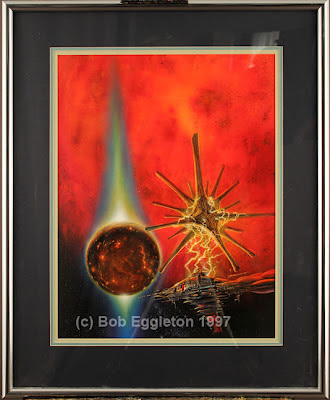 SOme special prices here and good bargains, paintings I want to get homes for. 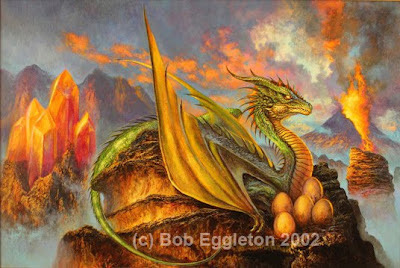 If you see something I do take PayPal and you can contact me at zillabob@cox.net.....thanks!!! 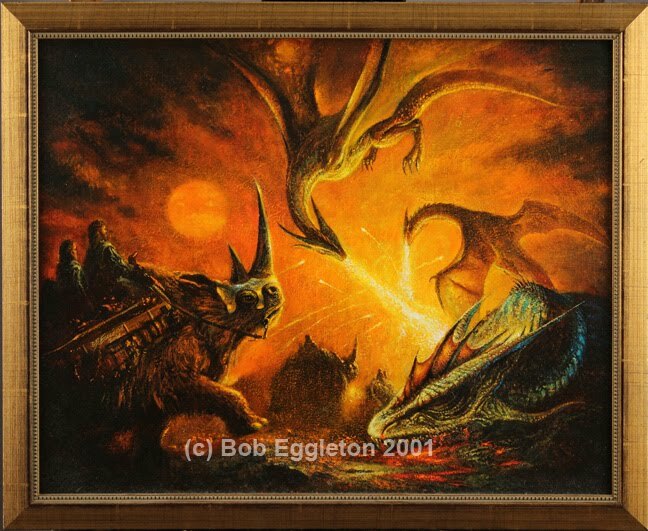 This is 16x20 not inc frame, acrylics on canvas from 2001, for one of Harry Turtledove's WORLD WAR INTO THE DARKNESS sequels. This one is SOLD. Scyllya and Carbribdes(1998). 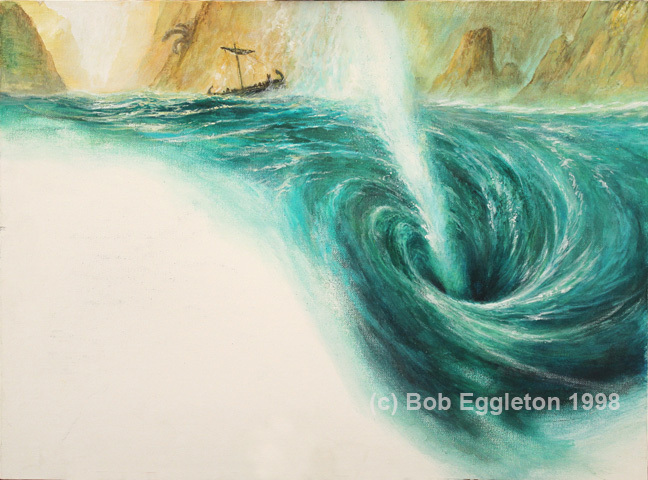 This is a two page piece of art from my SEA MONSTERS book. The art is white on the left side to accommodate for text. Acrylics on canvasboard, 18 x24 SOLD. 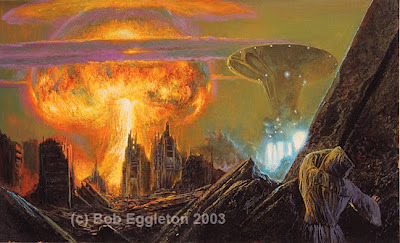 (1996)This painting is for Baen books novel by Wm Mark Simmons called ONE FOOT IN THE GRAVE. It's a fairly big piece, the art is approx 15 x25. The mat and frame/plexi extends out four inches on each side. This is acrylics, and represents some of my best airbrushing ever. Price is SOLD. 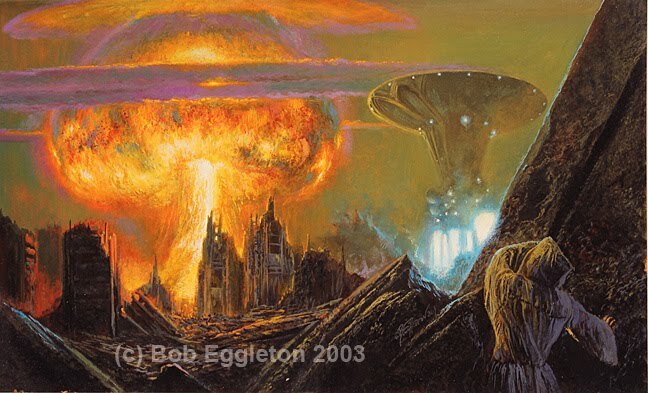 For the defunct mag SCIENCE FICTION AGE who commissioned color spreads. This one for a story I forget but it was alot of fun-a planet with a poisonous atmosphere and sea creatures. 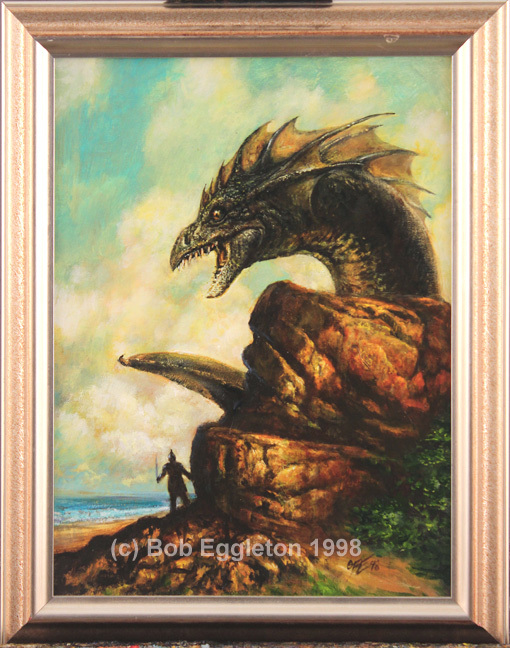 Size of image is about 15 x18, acrylics and it's matted and framed all around about 3 inches. SOLD$650. This was done for a Poul Anderson book for Easton Press, in 1998 THREE HEARTS AND THREE LIONS. It also appears in my Sea Monsters book. 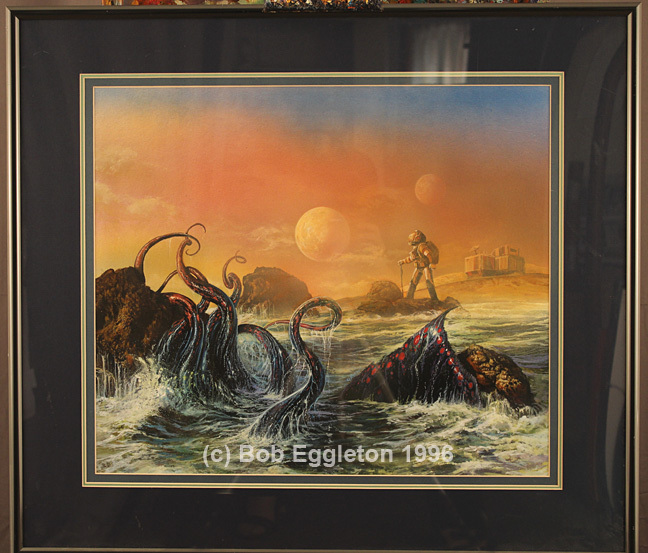 It's a small piece, about 12 x16 and it's framed. SOLD. 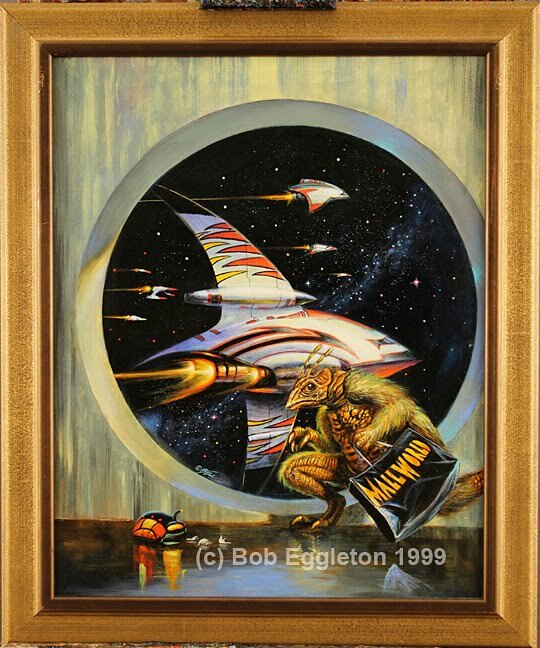 This was done in 1996 and again represents some of my best airbrush work for the time. 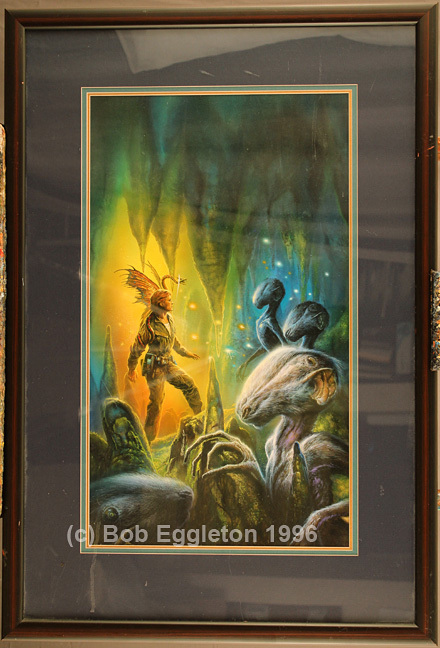 FOr an Alan Dean Foster Flinx book. About 14 x 23 image and 3 inches mat and frame out from that. The plexi is a tad damaged as is some of the frame but not badly. $SOLD. 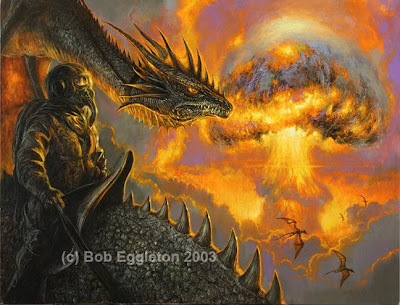 For the very last of Harry Turtledove's alternate WW2 books from Tor Books, this one involved dragons and their idea of an A Bomb detonating. Done in acrylics on canvas, 2003, it's 20 x26 inches. SOLD$1500. MALLWORLD-done for SP Somtow's Meisha Merlin re-issue of his book. 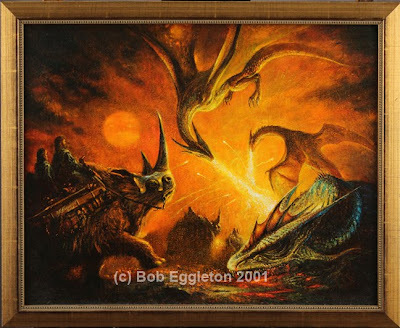 The art is 16 x20 inches and framed out from that. SOLD. Acrylics. 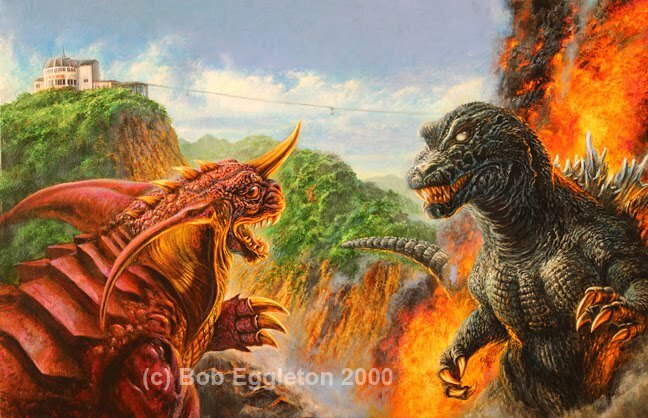 GMK: GODZILLA VS BARAGON, 2002, acrylics on canvas. For the cover to JAPANESE GIANTS fanzine. 20 x30 inches, $1850(SOLD!). 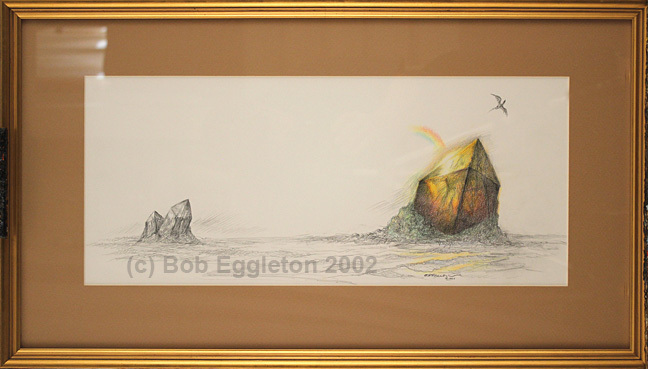 THE DRAGON CRYSTAL-drawing from DRAGONHENGE, about 20 x10 framed w/ mat. Pencil and watercolor on watercolor paper. $300. 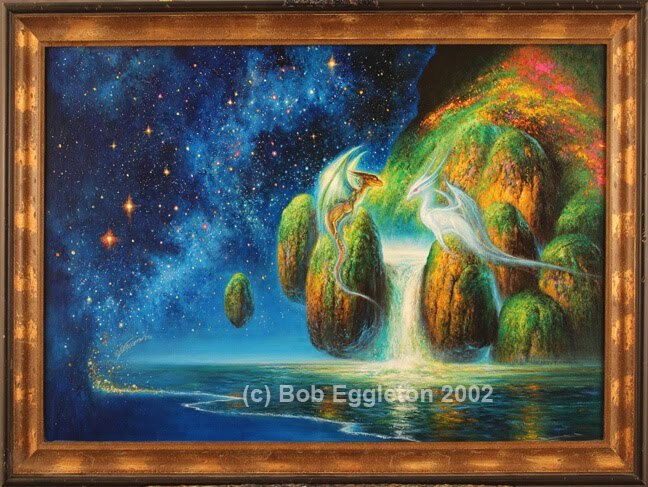 THE FAR FUTURES-image about 16 x 23 with 3" mat and frame extending outward each side. 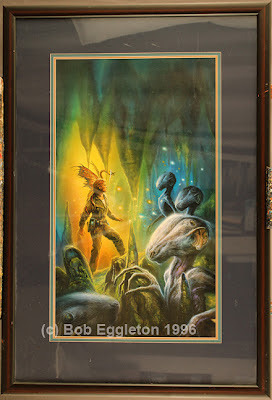 Done for a Greg Benford edited book, in 1997 for Tor. Price SOLD. A CANTICLE FOR LEIBOWITZ-done for a cover to an SFBC special edition of this classic SF book. 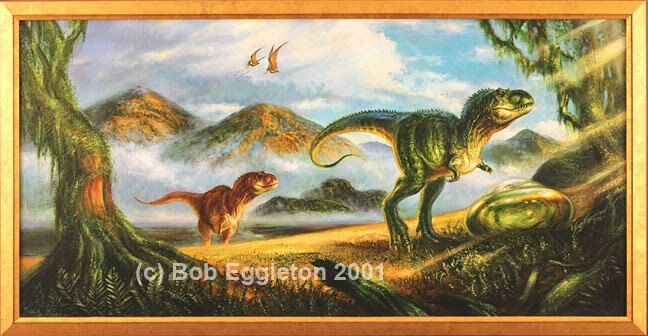 Done with gouache on illustration board, about 11 x 19 inches. 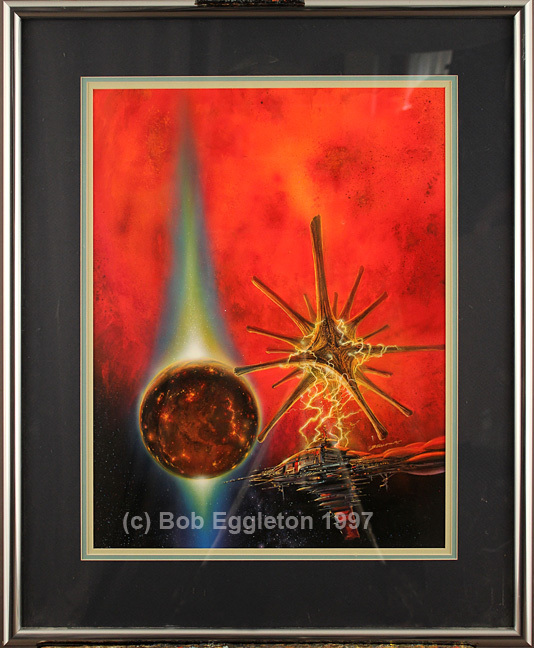 Unframed or matted. SOLD!. 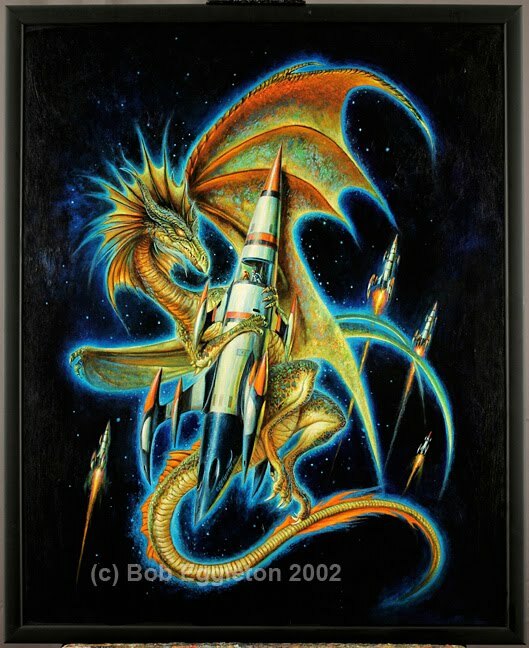 THE SPACE DRAGON -24 x30 inches. Acrylics on canvas 2002. Done for a SFBC carry bag and T shirt. 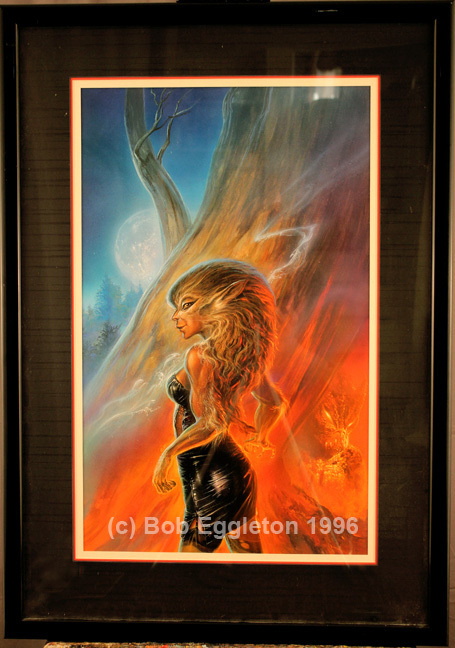 SOLD Framed. 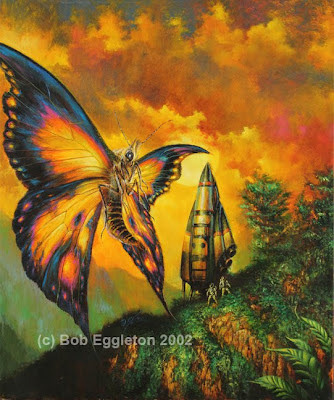 THE SPACE BUTTERFLY- 20 x26 acrylics on canvas. Done for a book I can't recall but it was a Baen Books collection. Price is SOLD$900. 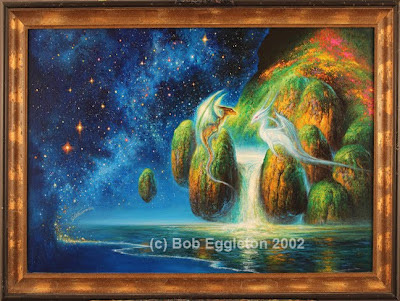 COSMIC DRAGONS- done for DRAGONHENGE as an interior spread. 20 x30 inches acrylics on canvas. $1800 framed.